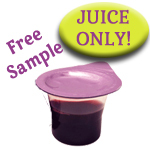 We're so sure that you and your congregation will love prefilled Communion cups from Celebrate Communion that we'll send you a free sample so you can try them for yourself. Free while supplies last. Limit 1 per church/ministry please. (Limited to US churches. International postage may be purchased.) Call 877-222-0771.